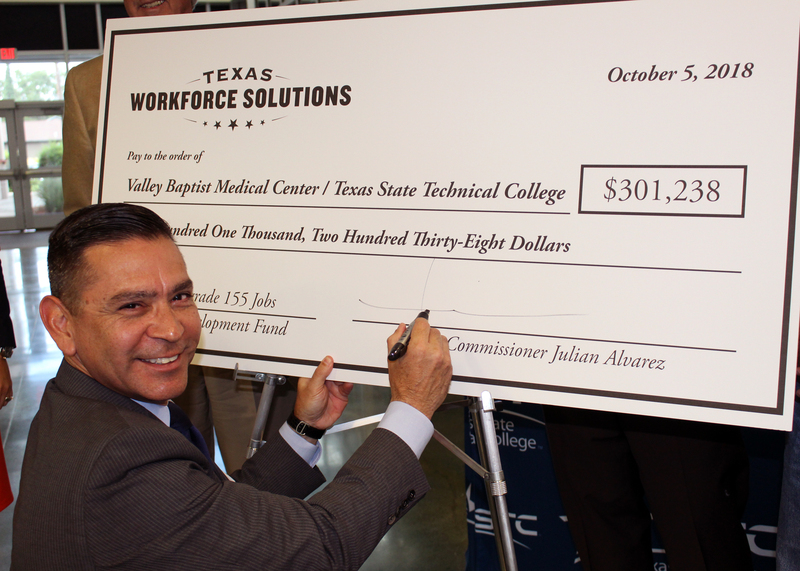 (HARLINGEN) – The Workforce Development and Continuing Education department at Texas State Technical College, in partnership with Valley Baptist Medical Center in Harlingen, recently received a Skills Development Fund grant for customized job training. The check, in the amount of $301,238, was presented by the Texas Workforce Commission (TWC) during a ceremony hosted at TSTC’s Cultural Arts Center this week. The training provided by this grant is already in session and will last one year. 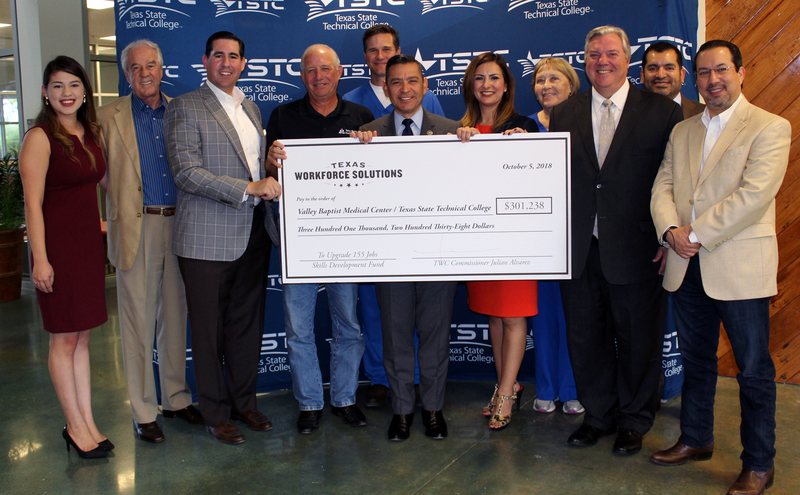 TSTC Workforce Development Executive Director Isidro Ramos said it is an honor to partner with TWC and industry to provide technical skills training. The grant provides customized job training for 155 Valley Baptist Medical Center employees such as certified nursing assistants, registered nurses and nurse managers. The training will focus on health care and social assistance topics, including personal leadership, quality management, trauma care, pediatric care and nurse’s aide skills. Valley Baptist Chief Nursing Officer Steven Hill calls this grant a blessing to his staff and the community they serve. Additionally, Valley Baptist employees who successfully complete the trauma and pediatric care after resuscitation, trauma nursing core course and emergency pediatric training will receive professional board certifications. “These additional certifications not only give our health care professionals an enhanced skill set, but also give our community a higher level of care,” said Hill. Valley Baptist Medical Center is the only level-two trauma facility south of San Antonio. It already partners with TSTC’s Allied Health division, serving as a practicum site for the college’s vocational nursing and registered nursing students. TWC Commissioner Representing Labor Julian Alvarez said the economic impact these types of grants have on the state is large. “I want to let everyone know that the stars are aligning for the South Texas region because of the support and representation you have in Austin. 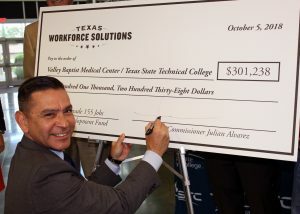 And TSTC, we thank you for always providing innovative training and understanding industry needs,” Alvarez added. For more information on training provided by TSTC’s Workforce Development and Continuing Education, call 956-364-4590 or visit tstc.edu/continuingeducation.